Stuck in the snow? As featured on the Weather Network, the safest and easiest way to get your truck unstuck is by using the Ditch Hitch Vehicle Recovery System. 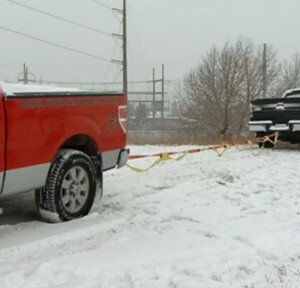 Airing across Canada during winter snow conditions, Deb Matejicka from the Weather Network reports on the use of the Ditch Hitch for getting a truck out that has become stuck in the snow. Check out the video below. As a member of the Petroleum Safety Association of Canada (PSAC), Ditch Hitch proudly sponsored the 2015 Annual PSAC Stars and Spurs Gala, helping to raise over 1 million dollars to support the Shock Trauma Air Rescue Society (STARS). STARS provides time, hope and life-saving transport to critically ill and injured patients in helicopters outfitted as mobile intensive care units. Ditch Hitch Featured on The Battalion Fire Fighters Reality Web TV!